The past weeks hot weather has again made lake fishing more challenging over the past week. There are a few anglers that have cleaned up however. With a few cooler days already this week and the chance of more, lake temps will drop to a more fish friendly level. Smaller high country streams have been the pick over the last week. 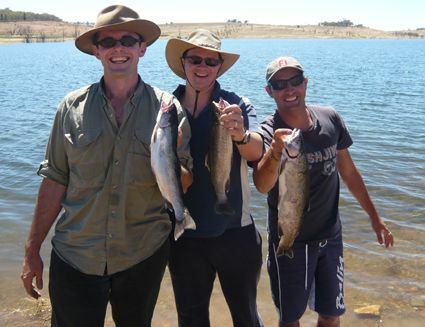 Lake Eucumbene:- The lake produced a few fish for some anglers but getting deep was essential from the reports received. There are heaps of stick caddis and snail moving out with the dropping water and if we can manage some cooler water temps the fish will be onto these quickly. Mudeyes have been hatching in numbers recently but not many fish have been on them due to the water temp. This is bound to change shortly and then the fishing will be excellent again. There are plenty of fat rainbows in the lake and when these fish turn onto the mudeyes there will be some fantastic evening fishing. Could even be better than last year. Watch this space! Areas to look at are Seven gates, Buckenderra, Braemar, Cobrabald, Coppermine, Collingwood, Yens, Springwood. Lake Jindabyne:- No Reports from Jindabyne again this week with water temps high. 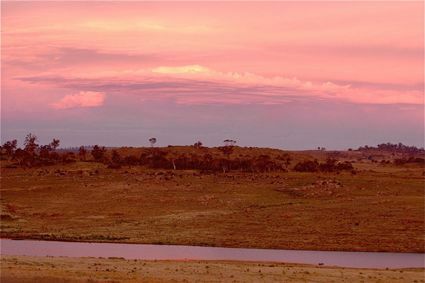 As in Eucumbene early mornings are going to be the best option. 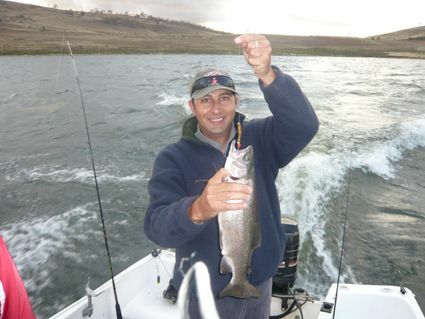 Eucumbene:- Trolling has been exceptional in the lake but you have to get deep! Downrigging, and lead core have been hands down the best methods over the last week . *Greg and Patrece fished a couple of sessions last week and did very well. Thursday afternoon they managed eight fish and then Friday morning cleaned up with twenty two! Biggest of the six fish kept was a just over a kilo rainbow. Three colours of lead core was not enough, five worked well. Forty feet on the downrigger also took its fair share. Yellow wing tassie devils Y94 and Y82 did the trick and they were fishing in the main basin area. *Peter Schroder also gave a good report of nineteen fish taken in a similar manner this week. *Hey Tom,Three of us trolled <?XML:NAMESPACE PREFIX = ST1 />Lake Eucumbene last weekend with some mixed results. On the Thursday we trolled anglers reach with poor results and only 4 fish for the day. Next morning at dawn we fished Collingwood Bay with 8 fish for the session all flat-lining with a couple of fish on the Sting lure green/gold. And one nice trout on freddo frog pattern. But the Rapala cd-5 Brook pattern doing most of the damage..We also had quite a number of hook ups and lost them near the boat.. Saturday morning saw the best results with 9 Quality Rainbows by 10 oclock. Again all on Rapala cd-5 Brook pattern. We got a couple on the lead core& 3 colours and downrigging to 3 meters but mostly flat-lining.. Fishing in close to the bank and early in the morning produced best results.. The fish were very fat and healthy and were full of caddis, mudeyes and hoppers&. *Chris Mould had a good spin session in the lake last week. Using 70mm Squidgy fish in Black Gold he landed three browns of 1.1kg, 1.5kg and 2.5kg. Spinning the trees on the Western shore amongst the trees was the best area. Lure type is important but not as important as getting it down. If you have not got leadcore or a downrigger then you can either get one or try using ultra deep divers or trolling sinkers to get down. Spinning off the bank with Celtas, Tassies, Snowy Minnows should return some nice fish when the water temp drops. Boat launching in Eucumbene is available at Old Adaminaby, The Dam Wall, Anglers Reach and Buckenderra. With the dropping water have a close look before trying to launch anywhere else. 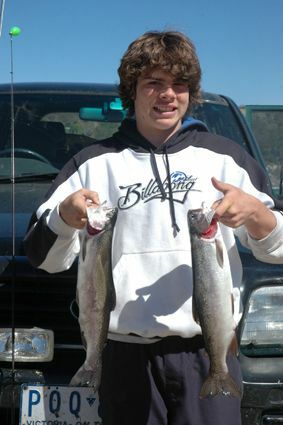 Jindabyne:- Jindabyne trolling reports trolling down deep has been the best method. Mudeyes have been a key bait over the last week though Powerbait is still doing exceptionally well in Eucumbene. There have been some very good success stories this week out of Eucumbene. Mudeyes continue to be the pick of the baits. *Richard Fejer sent some photos of a recent trip to Buckenderra. His 14 year old son Alex Fejer proudly caught these two rainbows of .970kg and 1.1kg on live grasshoppers at 9pm and 9:30 pm on a very cold night from our Quintrex. They were caught on a No.10 hook, bubble float and caught 1m from the bank in the grass. The 8 day trip to Eucumbene has inspired him to take up fly fishing. We enjoyed your store and visiting with you during our stay at Buckenderra. 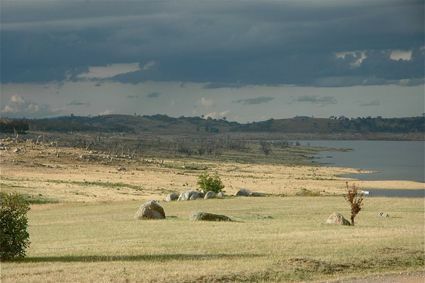 Jindabyne has also been very good with Mudeyes and the evenings would be the best time to hit the lake at present. Powerbait and Gulp wil produce some good fish during the day but look for deeper water on steep or rocky points.